A multifunctional bag, can be use as waist bag, should bag, cross-body bag, cosmetic bag, wallet purse, sport bag and travel storage bag. Sequins with two colors design is so special and stylish, makes you charming and outstanding. Adjustable strap fits different body and can also used for shoulder strap. Zipper closure is so convenient and easy to take in or out your stuffs. Perfect for daily, shopping, sport, travel, concerts, festivals. 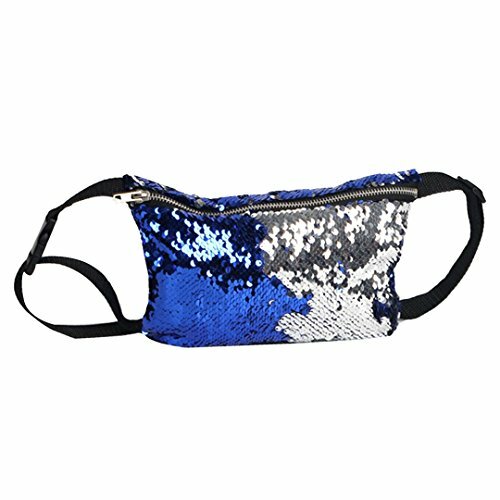 Function: Fanny pack, cross-body bag, shoulder bag. Color: Champagne Gold, Blue Silver, Red Silver, Pink Gold, Blue Pink, Green Black. Product Size: 9.1 * 5.9in. Packing Size: 4.0 * 6.0 * 1.0in. Packing Included: 1* Fanny pack. Washing note: Hand wash and machine wash are both ok. Please allow 1in difference due to manual measurement. The actual color maybe a slight different from the picture color, due to the different monitor and light effect.